I apologize for the delay in posting September's theme! I was sick all week and didn't have a chance. This month's theme seems to flow right from last month's theme of cycles. I hope you enjoy it! At the end of each month I will announce the totally optional theme for the following month. 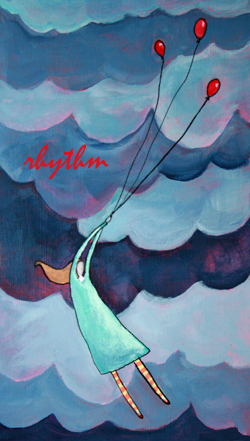 For the month of September 2013, the theme will be Rhythm. *Explore the idea of rhythm in a piece of art. *Create to your favorite music. *Make music. If you play an instrument, take it out and play. If you don't create rhythms with what you have, join a drum circle, make music with a child. *Pay attention to the rhythm of your days, write about it. *Include sheet music in collages. *Notice rhythms in Nature and let it inspire your work. Posted by Leah on September 1st, 2013 in creative every day 2013, rhythm | Permalink | No Comments.